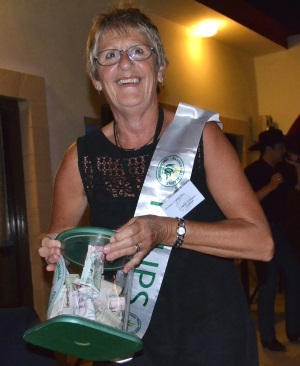 The very popular Devon (Mr Rodeo) is in Cyprus visiting his friends, Steve and Denise Bisson of Phoenix Line Dance Club, and he is taking the opportunity to help a North Cyprus charity by performing to raise funds for Help Those with Cancer Association (Tulips), a lovely gesture by a very professional entertainer. 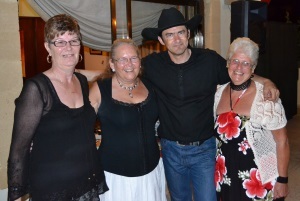 Those who have seen Devon perform before will know of his brilliant country music and rock and roll style and he certainly gets the audience in the mood with his music and movement around the stage area and amongst the tables. In fact one lady said to me she was “madly in love with him”. There was a large crowd of diners at Al Shaheen in Karakum on Tuesday 23rd June for Devon’s performance, all enjoying a meal from the a la carte menu and getting ready to enjoy the evening’s entertainment in aid of a local charity and we spotted Carole King and her husband arriving with the Tulip’s collection box for donations to the charity by the guests that night. Carole and her colleague Sue Tilt, have worked tirelessly for Tulips for the past 4 years and have been successful in raising huge amounts for the charity during this time, but they have now decided they need a well earned rest, although it seems they will both still be very much keeping an eye on things and so Carole was doing her normal fund-raising duty. 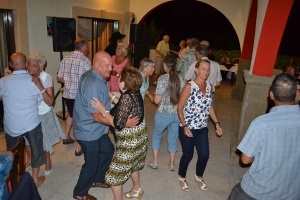 It wasn’t long before people were up on the floor dancing, including Steve and Denise and a friend showing us their extensive line dancing routines which of course blend in well with Devon’s country music. We were treated to music of Johnny Cash, John Denver as well as some of the rock and roll favourites, Elvis, Jerry Lee Lewis etc. Devon gave a brilliant rendition of American Trilogy and there were many others including my favourite – “The Devil went down to Georgia” which Devon performs so well with a lot of fast footwork. All through the evening, Imtiaz and his staff were literally running around keeping the guests happy, and there was a vote of thanks to them all for their hard work during which was a really enjoyable evening at Al Shaheen. 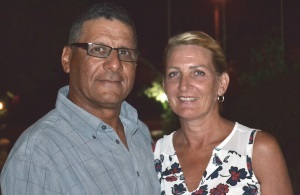 Chris was pleased to meet up with Ozkul Arif and his wife Susan, who were celebrating their 26th wedding anniversary. Chris and Ozkul had previously met on a trip to south Cyprus when Ozkul was very keen to talk about the area where he had lived as a teenager and Chris wrote about it following the trip. Ozkul would like a more in depth article written about his family and their experiences and this will be a story for future publication. Devon will be performing for Tulips at other venues during his stay in North Cyprus and these can be found in our Events Calendar which can be accessed by clicking here. See the slideshow below for more pictures of a great evening. This entry was posted in Special Events and tagged Al Shaheen Karakum, Devon (Mr Rodeo), Entertainment, Help Those with Cancer Association (Tulips), Phoenix Line Dancers by kyreniacatkin. Bookmark the permalink.